Responding to concerns that individual taxpayers may have found it difficult to correctly estimate their 2018 tax liability because of the many changes enacted in the law known as the Tax Cuts and Jobs Act, P.L. 115-97, the IRS issued relief from the penalty for underpayment of estimated income tax to individual taxpayers who have paid 85% of their 2018 tax liability with withholding and estimated tax payments (Notice 2019-11). The IRS expressed concern in the notice that the updated withholding calculator it released in February 2018 and the new Form W-4, Employee’s Withholding Allowance Certificate, have not made the problem of trying to calculate the tax withholding any easier. Under Sec. 6654(d)(1)(B), the required annual income tax payment an individual taxpayers is required to make is the lesser of (1) 90% of the tax shown on the return for the tax year or (2) 100% of the tax shown on the taxpayer’s return for the preceding tax year (110% if the individual’s adjusted gross income on the previous year’s return exceeded $150,000). Sec. 6654(a) imposes an addition to tax for failure to make a sufficient and timely payment of estimated income tax. 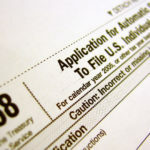 The IRS, however, is entitled to waive the addition to tax in certain unusual circumstances if its imposition would be against equity and good conscience. Accordingly, under Sec. 6654(e)(3)(A), the IRS is waiving the Sec. 6654 addition to tax for failure to make estimated income tax payments for the 2018 tax year otherwise required to be made on or before Jan. 15, 2019, for any individual taxpayer whose total withholding and estimated tax payments made on or before Jan. 15, 2019, equal or exceed 85% of the tax shown on that individual’s 2018 return. To request the waiver, an individual taxpayer must file Form 2210, Underpayment of Estimated Tax by Individuals, Estates, and Trusts, with his or her 2018 income tax return. The taxpayer should check the waiver box in Part II, box A, of the form and include the statement “85% waiver” on the return. — Sally P. Schreiber, J.D., is a JofA senior editor.